This is the story of Little Red, a bit familiar and a bit not. Here, Little Red is a cuttlefish and a cute one at that! She's on a mission from her mother to take Grandma some of her favorite crab cakes. All she has to do is traverse the sea swells to Grandmother's house...err, cave...to deliver the goodies and perhaps partake of her famous krill cookies. Easy peasy, right? Yes and no. You see, even in this underwater world, there are those that would love to relieve Little Red of her basket of tasty goodness, as well as those that would do her harm. Lucky for us and for Grandma, Little Red doesn't shy away when the going gets tough, she gets going...and though she promised to not ink any strangers, I think an exception can be made for this toothy non-friend. We've sampled this creative trios work previously on the site with much success and this one does not disappoint. It falls into that edutainment category we love to talk about because although one can purely enjoy the fantastical tale spun, you can't help but pick up a few bits of knowledge and info along the way. 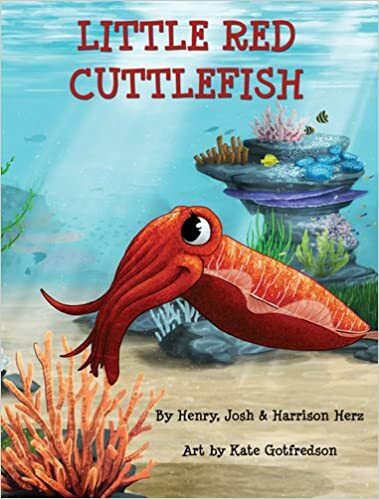 For example, did you know that male and female cuttlefish have a different number of arms? Or how about their amazing ability to camouflage themselves in the blink of an eye from predators by changing color, pattern, and skin texture? Let us not forget about that portable ink cloud they can shoot as a last resort! So much amazing info to spare AND an enjoyable new take on a tale we've grown up with...I'd call that a win for all parties. Recommended read for all ages from the tall to the small. The story is rather enjoyable, the characters entertaining, and the illustrations the wonderful icing on the krill cookie. Henry Herz writes fantasy and science fiction for children. Henry is a member of the Society of Children’s Book Writers & Illustrators (SCBWI) and the Science Fiction & Fantasy Writers of America (SFWA). Henry participates in literature panels at a variety of conventions, including San Diego Comic-Con and WonderCon. Henry created KidLit Creature Week (www.birchtreepub.com/kcw/), an annual online gallery of monsters, creatures, and other imaginary beasts from children’s books. Henry writes articles about children’s literature for TheWriteLife.com. He reviews children’s books for the San Francisco Book Review and the San Diego Book Review. Special thanks to the authors three for the access to the ebook for review. (THANKS!) For more information on this title, the authors, the publisher, or those titles on the horizon, feel free to click through the links provided above. This title just released earlier this month via Pelican Publishing Company, LLC, so be on the lookout for it on a bookstore shelf or virtual retailer of your choosing.